Wow! 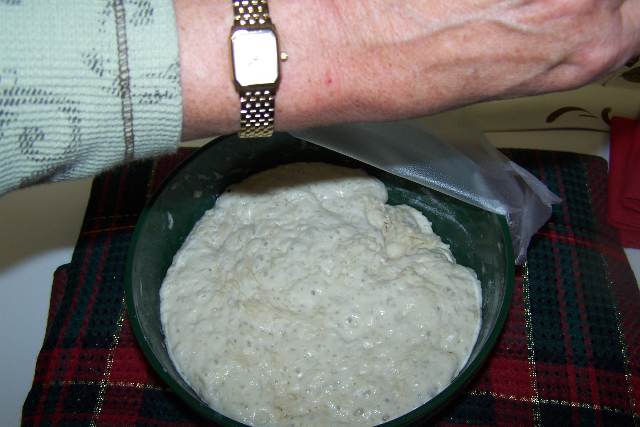 My postings on “No-Knead Bread” are among the most popular sites here at Best Room in the House. 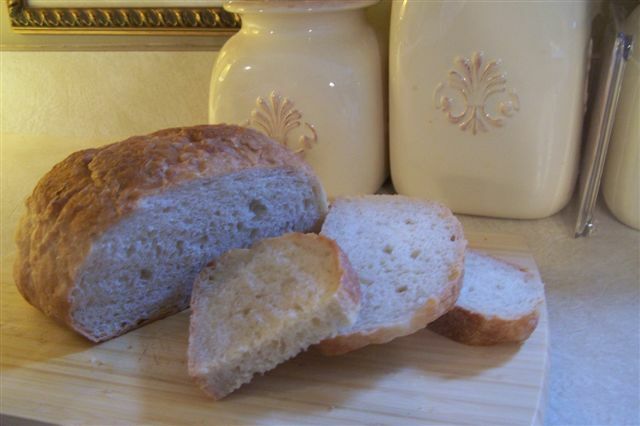 There is tremendous interest in making the bread and a host of former non-bread bakers have taken up bread making because of the simplicity and near foolproof methods used for the bread. As a bonus, it costs about 85 cents, not counting the cost to heat your oven. Did I mention the delicious taste and the wonderful crust? Once you try this bread, you won’t want to buy any more bread at the grocery store.I decided to provide a step-by-step photo guide to further tempt those of you who have yet to give it a try. So, with the added proviso, “I am not a photographer”, let’s get started. 1. 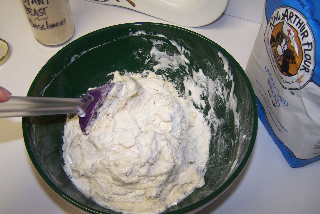 Here’s what you need:3 c. flour, 1-2 tsp. 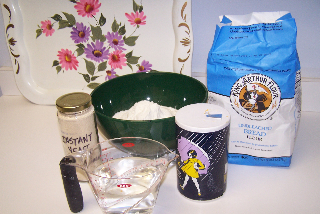 salt, 1/2 t. instant yeast, 1-1/2 cup water. 2. 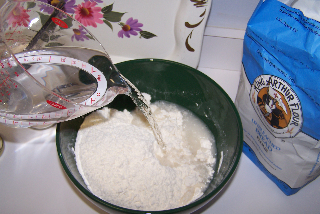 Mix the dry ingredients and stir just enough to make sure you get all the dry flour on the bottom of the bowl into the dough. 5. 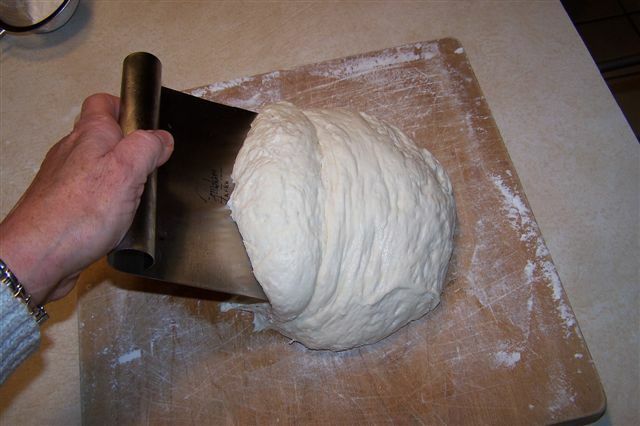 Now we’ll let the dough rise, covered with plastic wrap, for at least 12 hours. 7. 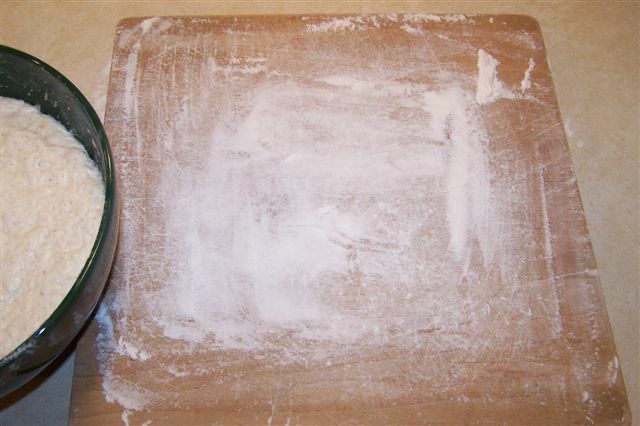 Prepare a floured surface. 9. See? Wet and sticky. 10. 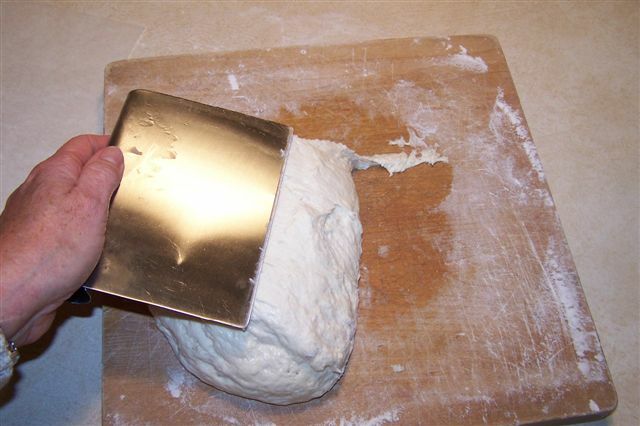 Sprinkle with a little flour. 11. Fold over all 4 sides like an envelop. 12. Re-cover with plastic wrap and let rest for fifteen minutes. 13. 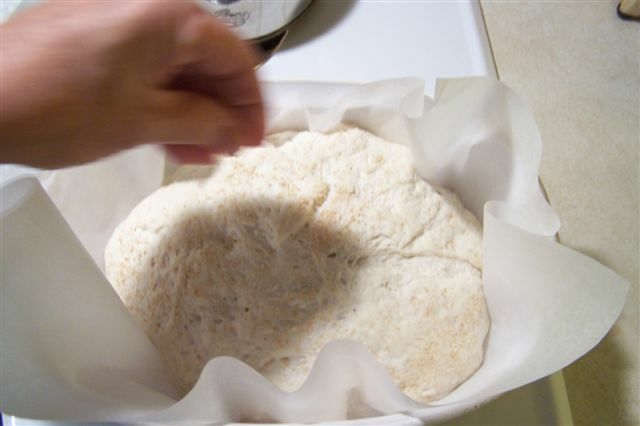 Now we’ll let it rise the second time, but first, refold the dough into a rough loaf shape (it’s very fluid dough and won’t stay in a perfect loaf shape; it will be a roundish blob) and place on a 12 x 18 inch piece of parchment paper. Sprinkle top of loaf with wheat bran if desired. 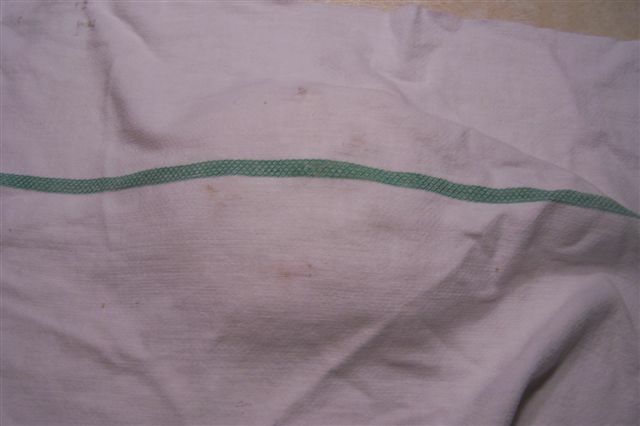 Cover with a non-terry cloth dish towel. 15. Carefully remove the very hot pot from oven. Take the towel off the bread. Pick up the parchment paper with the dough on it and carefully lower both into the hot pot. Sprinkle with Kosher salt if desired. 17. 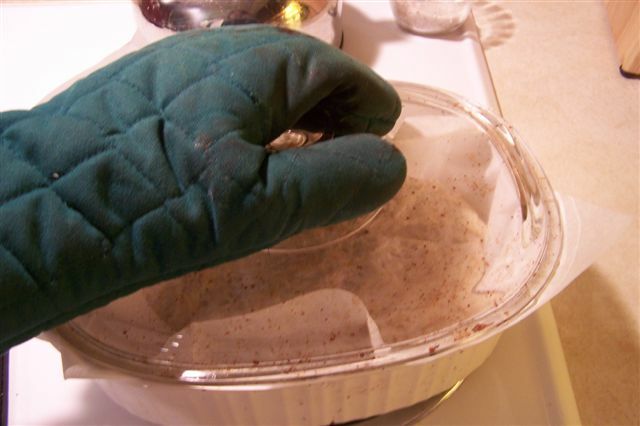 Remove the lid and bake another 15 minutes. 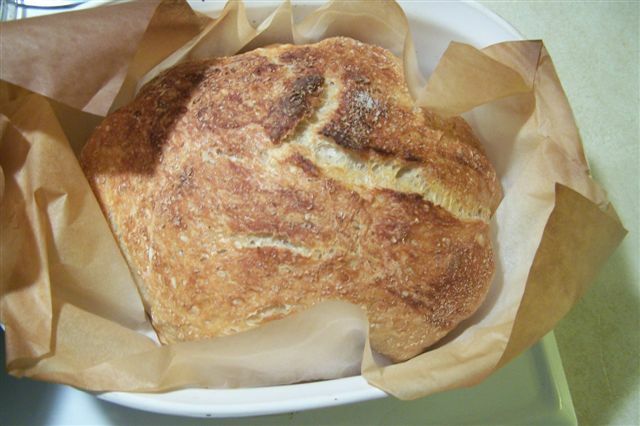 If you would like more information on No-Knead Bread, you can check my previous postings here, here, here, here and here. 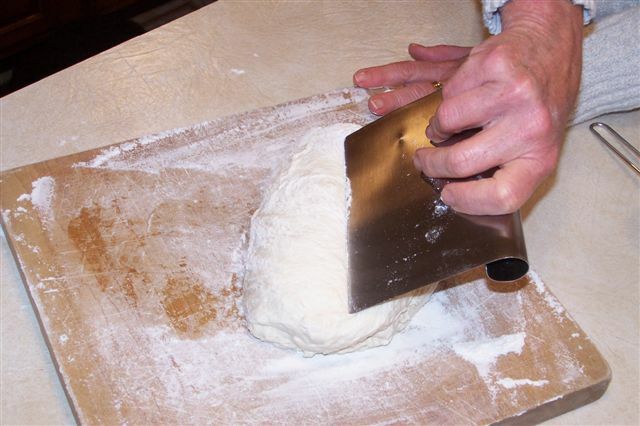 There is also a veritable wealth of information on the internet on bread making in general and different methods of making the No-Knead Bread. 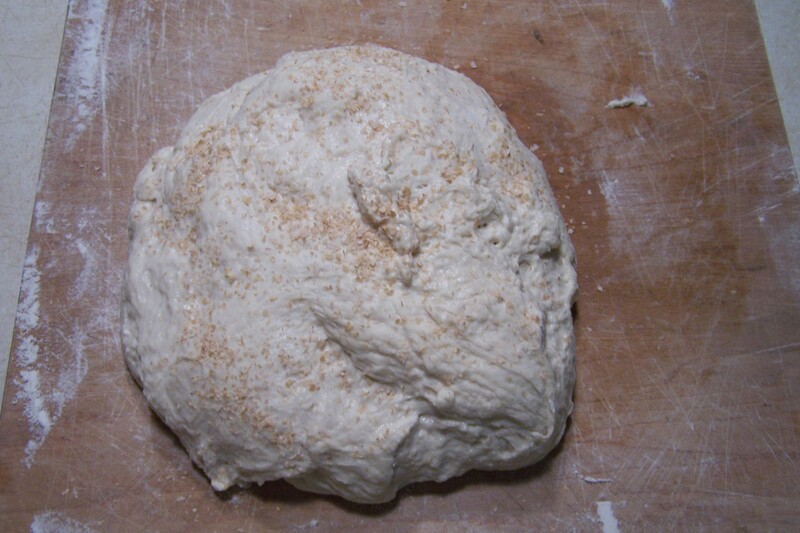 I use a couple of different recipes, sometimes adding seeds to the topping, sometimes adding flavoring elements to the dough itself. Be brave and go for it. Your waistline may suffer, but the rest of you won’t. I cannot wait to give this a try. Thanks! Maybe you could tell what kind of pan I usually use. It’s a 3 qt. 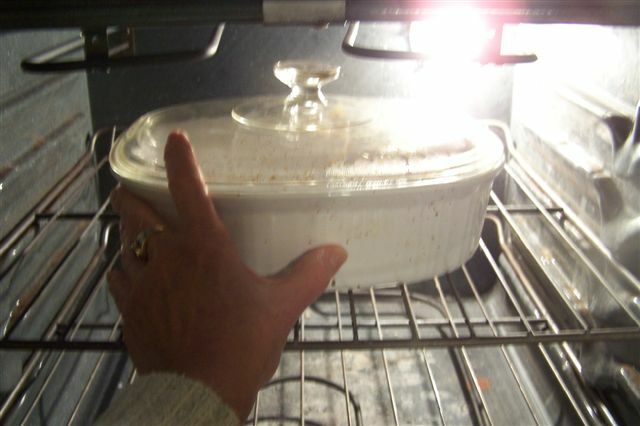 Corningware casserole with a glass lid. It makes a nice size loaf. I just wipe out any crumbs that are in it and don’t bother to wash it. I store it in my oven so it’s all ready for the next loaf. 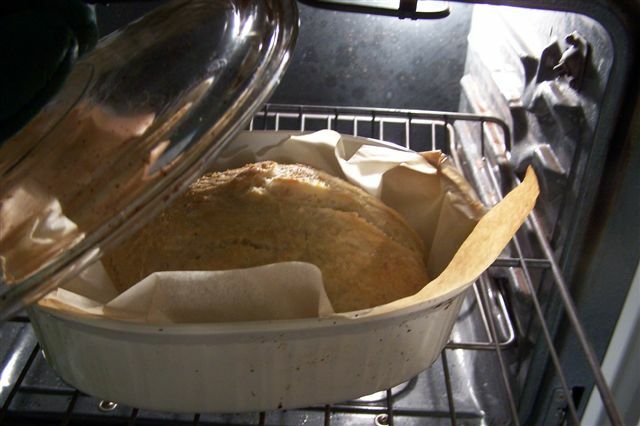 You can use a Dutch oven, just make sure that the handles can “handle” the high heat. My Dutch ovens are pretty big and allow the dough to spread out more which makes a shorter loaf, not quite as short as foccaccia. I hope you try it. I know you will enjoy both making it and eating it. I bought one of these with a gift certificate for Christmas. It was the article attached to it which ultimately led me to your site after a brief Google search. The pot just arrived this afternoon. 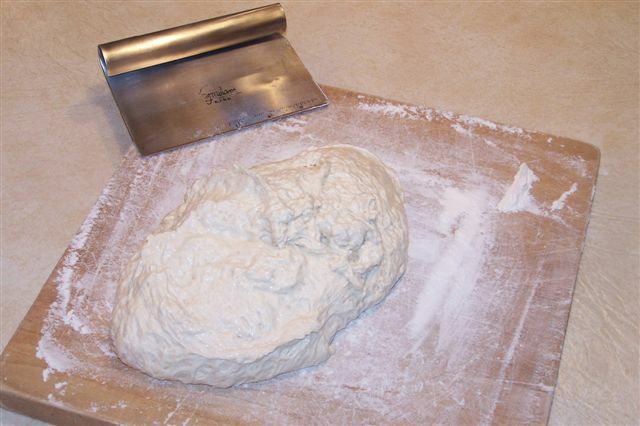 My dough is mixed and rising right now!! Santa Claus is wonderful! Next year, leave a slice of bread and butter for him instead of cookies. Looks like a great pot. I have a 4 and 5 qt. Dutch Oven which do well. Have fun. Don’t eat too much of it. Make it and give it away to really make your friends happy. I so appreciate your posting pictures of the process. They gave me the courage I needed to give this a go. I posted my results here. This is awesome. I had never thought of using a baking dish. Oh I am so late to this post, but Morgana how to adjust the recipe for regular yeast? I don’t have the instant kind. 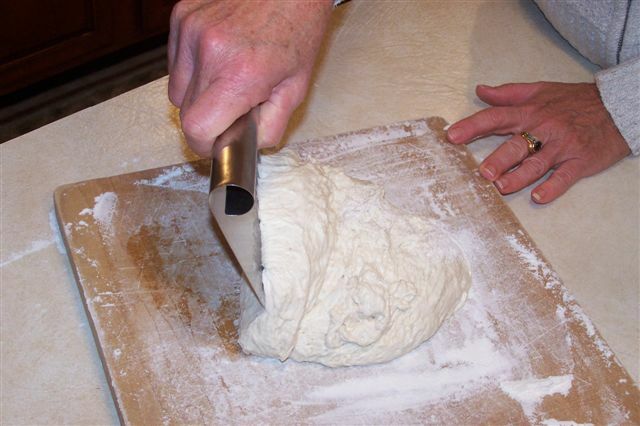 Also would kneading using my Kitchen Aid reduce the rising time? 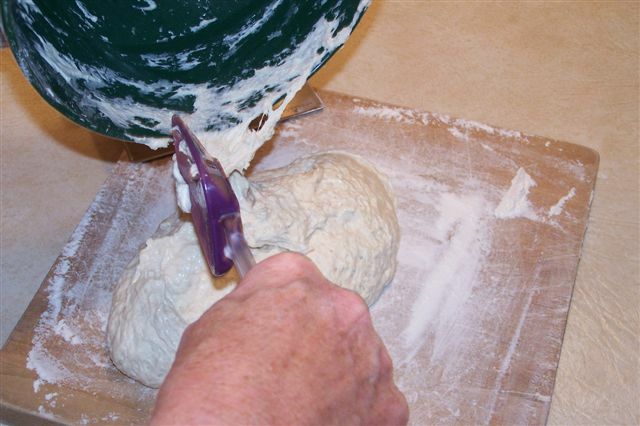 The dough is pretty wet and is hard to knead. 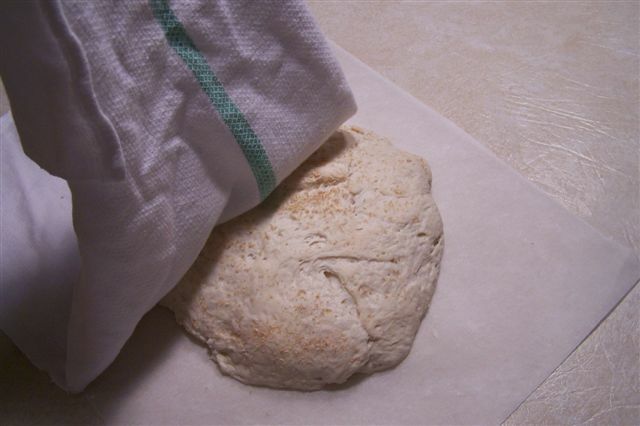 The pertinent attribute of this recipe is the long rising time which produces a special bread. 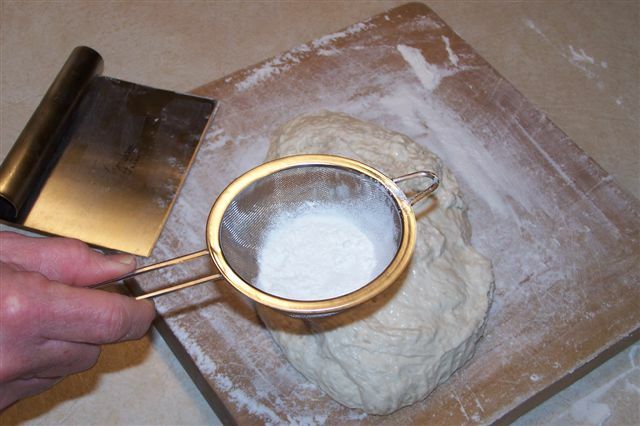 I suppose if you wanted to give it a try using your Kitchen Aid with the dough hook, you could. I have no idea what the remaining rising time would be. Sorry. Thank you so much for the pictures! I also tried baking in a corningware pot, just like the one you show, but had a terrible problem with the bread sticking to the dish. I will try again with the parchment paper! Your bread looks so good. 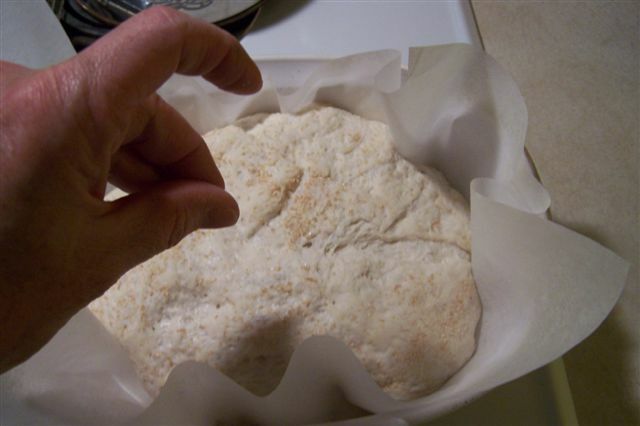 The parchment paper works great, for bread and all sorts of things. Thank you for this instruction. I have baked five loaves so far following Jim Lahey’s recipe — exactly as you do here step by step, except that I use my Creuset (with a replaced metal knob). The bread tastes wonderful. But I cannot get the fissures on the top crust, and the bottom crust is very thick and it’s tough to slice. Do you have any idea? 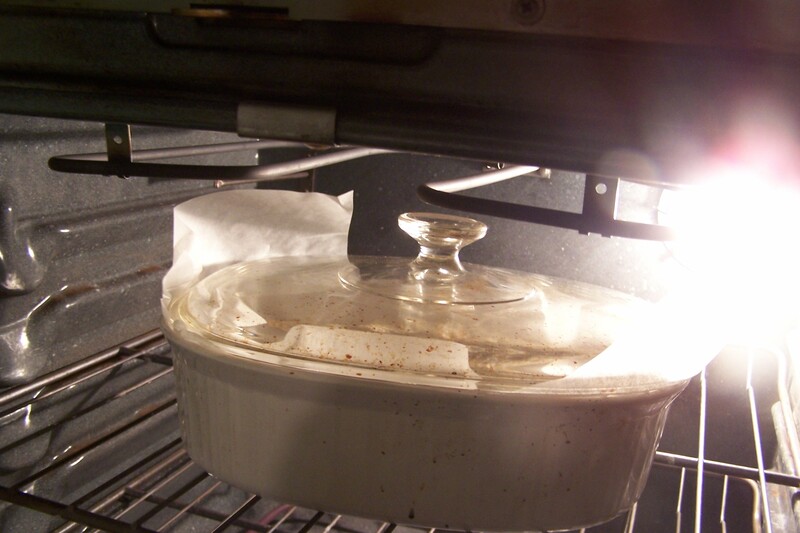 Longer baking with the pot covered to let the steam escape from the dough? K.
I have found that problem sometimes. I lower the heat a bit, maybe 450. Try that. on August 25, 2010 at 12:15 pm | Reply Jen R.
You need to heat the lid of the dish with the dish before you put the dough in it, correct? Thanks.